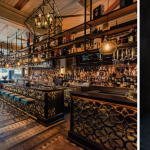 Glovers Alley triumphs at the Food & Wine Awards 2018 with three wins – Andy McFadden takes home Overall Best Chef award and Best Chef Dublin while Aoife Noonan is crowned Pastry Chef of the Year. Glovers Alley by Andy McFadden was honoured with three awards at the prestigious Food & Wine Awards 2018 with Overall Chef of the Year and Best Chef Dublin going to Andy McFadden and Pastry Chef of the Year going to Aoife Noonan at an awards presentation held on Sunday the 9th of September at the InterContinental Hotel, Dublin. Glovers Alley by Andy McFadden opened in February 2018, when Dubliner Andy returned home to partner on it after a successful 10-year career in Michelin star restaurants in London. Andy brings to Glovers Alley his signature Modern French style of cooking that showcases top-end Irish-produced ingredients. Aoife Noonan is the restaurant’s executive pastry chef. Winner of the Valrhona Patisserie Championship, Aoife has trained in the world renowned Valrhona L’Ecole du Chocolat in Paris. Glovers Alley is a spectacular, 70-seater destination restaurant. The chic, glamorous and sophisticated 1930s-inspired interior is decorated in moss green leather and powder pink upholstery with walnut panelling, a mirrored ceiling and marble tabletops, making it more than a match for the lovely views over St Stephen’s Green. Glovers Alley by Andy McFadden is open for dinner Tuesday to Saturday located at 128 St Stephen’s Green, Dublin 2.